A government system used to confirm the identities of citizens online is failing to work for most of those trying to register. 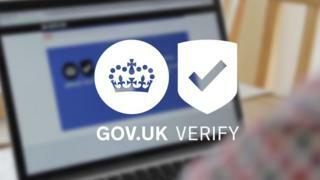 Gov.uk Verify is designed to prove someone's identity when they log in to access services, such as applying for universal credit or paying tax. But Cabinet Office statistics show the system verified less than 50% of users. Labour MP Jon Trickett has called its performance "shocking" and "inefficient". However, the government said the success rate "compares favourably" with other online identity services and was saving the taxpayer money. The government took six years to develop the Verify system, which went live in May 2016 - three years later than planned. When people go to the Gov.uk website, they can pick one of a number of companies to "verify" them, giving personal details to, for example, Barclaycard or the Post Office to run a check. Once it has verified the user's identity, the company lets the government know they are who they say they are. Users can access 15 government services so far through Verify - if they register successfully - including personal tax accounts, checking state pensions and vehicle licensing. The plan is to increase this number in both private and public sector services. The Government Digital Service - in charge of its development - has set a target to reach 25 million registered users by 2020 and wants it to become the default system, replacing the likes of Government Gateway. However, 18 months after its launch, it has only 1.5 million registered users. And a written parliamentary question by Mr Trickett revealed less than half of the users trying to register with the system were getting verified. In its best performing month, January 2017, 49% passed through the system successfully, but this had fallen to as low as 32% in June 2016. The last available statistics showed a success rate of only 38% for August 2017. Parliamentary under-secretary at the Cabinet Office Caroline Nokes also published the statistics for the best performing certified company, which saw the success rate rise to between 64% and 74%, although she did not name it. "It is just not good enough," said Mr Trickett. "It is one of the most inefficient uses of taxpayers' money you could imagine. "This is a system using individuals' data. They are human beings, and the success rate of this system with their data is troubling." A Cabinet Office spokeswoman said it "remains confident" in its target as it continued to "innovate and improve" on the system. "Verify has already saved the taxpayer over £110m - more than double the amount it has cost to deliver," she said. "We are committed to rolling out Verify and continue to work towards signing up 25 million users by 2020, making it easier for people to access the services they need."